As part of the replacement programme for the post-war AEC Regents, by Leyland Atlanteans, a number of second-hand vehicles were purchased by Hull Corporation. As mentioned in a previous Hull Corporation posting one of these batches were twelve AEC Regents from Leicester Corporation, which were purchased in 1966. They were allocated fleet numbers 201 to 212, but this was amended in October, 1966 to 101 to 112. Nine of the vehicles which were then in service had their fleet numbers altered, but 109, 110 and 112, entered service carrying the new numbers. Registration marks were FBC 282 to 288, 291 to 295. They were withdrawn between November 1968 and December 1969. The photo shows 103 (FBC 284) leaving the Coach Station on service 30 to Stoneferry. The streamlined livery on this strangely old-fashioned body style gives this bus a very 1930s feel. The bodies were actually MCW, not Weymann, based on a design going back to 1933! Obviously upgraded and updated, but nevertheless to the old basic shape. Very attractive too, but I think they looked even more wonderful in Leicester’s glorious maroon and cream. LCT had another batch of Mark IIIs, with Brush metal bodies, and these too were very attractive vehicles, the post war Brush metal framed bodies being most unlike the composite style. Leicester was a most interesting fleet, right from the early days, and one which I plan to study in a bit more detail as I have lived near Leicester now for over 40 years. Talk about unobservant, I’d not even looked at the "title" paragraph. Just to be really awkward, John, they are MCCW (Metropolitan Cammell Coach Works). MCW (Metropolitan Cammell – Weymann) was a marketing company until the two firms merged in 1965/6 to form a new MCW manufacturing company. I thought MCCW stood for Metropolitan Cammell Carriage and Wagon (Co Ltd). That’s what it said on Manchester Corp’s body plates. I think that more than anything else it’s the sharply raked-back of the front, and consequent small first upper deck window, that makes this design look so archaic. Hi David – Sorry MCCW stood for Metropolitan Cammell Carriage and Wagon, a builder solely of railway rolling stock until a diversification into steel framed bus bodies circa 1930. Bodies of the same basic design as FBC 284 were also supplied to Nottingham, Salford, Wallasey and Glasgow (Glasgow’s were built by both MCCW and Weymann’s). I remember both these and the Brush bodied ones in service in Leicester. Powerful engines and pre-select gearboxes gave a very smooth ride – far more refined than the All-Leyland PD2s, in my opinion. Does anyone know if Hull CT reregistered these purchases with local registration numbers. Reason for asking is that there has recently been posted on the Old Hull facebook page a picture of a bus not in any of the Hull operators livery but bearing a local reg No GKH 384. The bus in the photograph Reg Oakley refers to is a Leyland TD series, and its registration matches its age, falling in the gap between a batch of Hull AEC Regents and a pair of East Yorkshire Leyland TD7s. Therefore it isn’t a re-registration. Hopefully someone will recognise it. I’ve created the link below to the facebook page mentioned by Reg Oakley (above) – creating such a link is perfectly within the rules. If you scroll down the comments on the said facebook page you’ll see that the vehicle has been identified as being ex-Hull Corporation, one of four Leyland TD7/Leyland diverted to Hull in 1942, 200-3 (GKH 381-4). In the facebook pic (reputedly taken in 1960, the year of GKH 384’s withdrawal from the passenger fleet), it looks as though it might have been transferred to an alternative council department. Titan no. 203 went to the City Engineer’s Department for staff transport to new estates on the edge of the city and was given an all green livery and lasted until sometime in 1963. Believed scrapped in 1964. Regents 245 and 250 also went the City Engineer in 1966. This bodywork reminds me so much of Provincial of Gosport’s similar-bodied pre-war buses – only the post-war radiator giving the game away as to the Hull version’s relative newness! This photograph was taken in Summer 1969, at a very familiar location in Hull and it shows 170/2 OTV165/7 of the KHCT fleet. During 1967, KHCT acquired no less than 36 of these Park Royal bodied Regent IIIs from Nottingham City Transport, exactly half of the batch of 72 such vehicles registered OTV 127 to OTV 198 and delivered to Nottingham City Transport between June 1953 and October 1954. They were numbered 150 to 185 by Hull, but not one of them had a Hull fleet number that matched its registration! The front destinations were altered to Hull specification; the rear ones were panelled over. They were withdrawn by Hull between 1970 and 1972. One vehicle, 157 (OTV 137) then became a training vehicle, and still survives; it can usually be seen at Sandtoft Trolleybus Museum, restored to its original NCT livery. 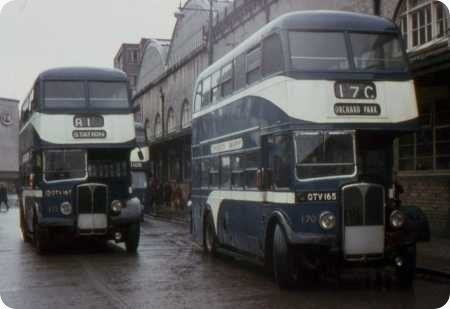 What an evocative picture, even if they are not native KHCT buses, how well the streamline livery sits on them! The location is, of course, the Coach Station in Collier Street. How lucky we were in Hull to have a coach station; instead of a mundane bus station, like other places. It was called coach station from being opened in 1935, this in spite of the fact that KHCT never owned any coaches for general service until the 1980’s! 170 has just arrived from Orchard Park via Beverley Road on the circular service 17C, whilst 172 is arriving from Willerby road on service 81. I recall OTV 137 at Sandtoft in the early 1980’s carrying the streamline livery of KHCT. I remember them new in Nottingham, where they ousted the pre-war Regents on the Bilborough, Broxtowe and Strelley services (13, 16, 16A, 30, 32, 56, 60, 62). In fact Bilborough depot’s allocation was almost entirely from this series. They also filtered onto a few other individual routes. I am pretty sure they never or rarely appeared on the Arnold group of services (10, 20, 20A, 52, 57) which retained pre-war vehicles until the arrival of the exposed radiator Regent Vs in 1955-56. I remember these coming to Hull and causing me a lot of confusion, or at least the one that survives did. I saw it (157) and in my mind matched registration number to fleet number. I happened to go to Nottingham later that same day and was somewhat surprised to find OTV 157 running there. It was a little while after before I realised my mistake and that I hadn’t seen the same bus working for two operators on the same day! In addition to these ex Nottingham buses Hull also bought ex St Helens RTs (see here) one of which BDJ 87 is preserved at the Lathalmond Museum in Saints livery. In addition Hull bought ex Newcastle Daimlers with Birmingham style bodywork (see here) and some AEC Regent IIIs also with MCW bodywork from Leicester. In addition to Nottingham selling these to Hull three of the batch went to Grimsby-Cleethorpes. I remember conducting on them and thinking they seemed pretty archaic compared to our Bridgemasters. The Grimsby-Cleethorpes trio were OTV 159/161/163, purchased by GCT in 1967 to replace their 3 1946 RT Regents, 80-82 (JV 9900-9902). The Nottingham vehicles initially took over these three running numbers, but then became 112-114 in 1969 to release the earlier numbers for new Daimler Fleetlines. Stephen – As you say, the OTVs were the basic allocation at Bilborough depot for most of their time in Nottm; the remainder of the batch was based at Parliament St and spent most of their time on the Beeston rota. After trolleybus conversion, they also appeared on Wells Rd routes 40 and 47 until withdrawn. I also never saw any on the Arnold (Sherwood depot) routes. Philip – I agree your comment about these appearing archaic; I have subsequently found in Alan Townsin’s TPC book on Park Royal that these vehicles had been due for delivery in 1950, hence the 5 bay bodies, half drop windows, and late 40s, early 50s style interiors, with varnished/polished wood, which were a world away from the Park Royal Regent Vs delivered in 1955/6. But at least they were 8’wide! One of the trio of OTVs sold to Grimsby Cleethorpes also survives in preservation. The bus concerned is Nottingham 161, which can be seen at the GCR Heritage Centre at Ruddington, near Nottingham. It is also restored to Nottingham’s green with cream bands livery. The original order for the buses that became the OTVs was for 112 buses, placed in 1948 for delivery from 1950. When the 72 OTVs came in 1953/54 the chassis had to be shortened to 26 feet from 27 feet (one foot removed from the rear overhang) to suit the Park Royal bodies which, at 26 feet long, were to the pre 1951 legal length for a two axle double decker. The choice of a five bay body must have been down to Nottingham as Park Royal had a four bay body for the Regent III in production from 1947 (examples supplied to Huddersfield, Morecombe and West Bridgford). The choice may have been to standardise on the half drop windows used, which were as used in the BUT 9641T trolleybuses. Another feature, also seen on the 9641T trolleybuses, was the placing of the batteries under the stairs (as with the RT) rather than in cradles on the chassis side (as with Nottingham Met-Cam and Roberts bodied Regent). The 72 vehicle were almost identical. Variations were 150 with its opening front upper deck windows and the last deliveries of 1954, which had to have a second rear lamp to meet changed legislation fitted. This was incorporated in the bottom of the grab rail positioned against the back platform window. The balance of the 112 were received as the ten SAUs and the 30 UTVs. The OTVs did certainly dominate the allocation at Bilborough Depot, which, from memory, was from about bus 156 to bus 198, until replaced by NAU and RTO Fleetlines in the middle 1960s. Bulwell also had its Roberts bodied Regents replaced by Fleetlines (RTOs) about 1964. The others were based at Parliament Street and were used on a variety of services including the Beestons, the West Bridgfords, the Sneinton Dales and the 25 and 58. From my observations Parliament Street’s share of the Arnold services were worked by PD2s, but what worked these prior to the arrival of the PD2s? Prior to the arrival of the Regent Fives Sherwood had an allocation of the Daimlers with both Brush and Roberts bodies. Thanks Michael. I don’t actually ever remember seeing PD2s on the Arnold routes. My recollection is of wall-to-wall Regent Vs from 1956, prior to which memory says that they were operated by pre-war Regents (Metro-Cammell and Cravens). However I have seen enough photos to convince me that my memory is not infallible! – Daimler CVD6s were also used. It is also certain that the 10 was often singled out for the left-overs – utility CWA6s or second hand pre-war Halifax Regents. Also, in the early 50s, the Redhill route that became the 57 was one end of a cross-city 4/4A from Beeston, often served by 1948 Metro-Cammells. Similarly, the 3 Sneinton Dale was originally a cross-city service, starting at Radford (Addington Road) and at that time invariably pre-war Regents. Both the 3 and 4/4A were split in two, I guess, around 1952/53, Redhill becoming 57, Radford 58, and a new extension beyond the Sneinton Dale terminus of the 3 became 59. The Parliament Street OTVs were also widely used on the Trinity Square-Bestwood area services (6, 17, 18, 28) and the Gordon Road routes (9, 23, 54, 65). Hi Stephen – The link between Beeston and Arnold dated back to April 1933 when service 4 was linked to services 10 & 20. At that time service number 4 was used for the Beeston to Nottingham part of the journey and 10 or 20 used for the journey through to Arnold. Service 10 ran via Mansfield Road past the Home Brewery to Redhill Road then via Redhill Road to the Mellors Road junction. Service 20 ran via Mansfield Road then via Nottingham Road (Arnold), Front Street, Church Street and Mellors Road to the Redhill Road junction.At this time all journeys between Beeston and Nottingham whether by via Derby Road or Castle Boulevard were service 4 until 2nd April 1944 when journeys via Castle Boulevard became 4A. When the Arnold tram service was converted to bus operation from 6 September 1936 service number 10 was used for the service between the Old Market Square and Valley Road, Sherwood. Service 20 still operated between Mellors Road but ran through to Trent Bridge via Arkwright Street. The service to Redhill Road via Mansfield Road then became the 4, running through from Beeston (via either Derby Road or Castle Blvd). 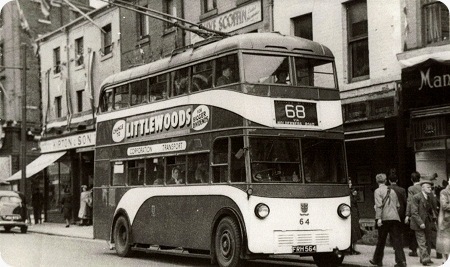 The split between Beeston and Arnold took place from 25th May 1952 when the 57 was introduced between the Old Market Square and Redhill and the 4/4A became solely a service between Beeston and the Old Market Square. 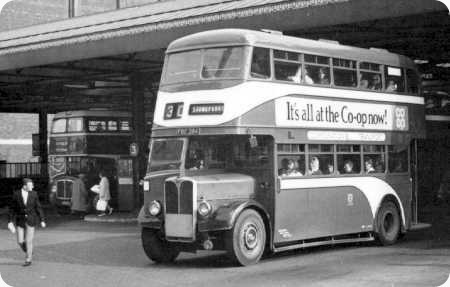 Through operation by service 3 between Sneinton Dale and Addington Road, Radford ceased from 12th April 1953 when service 58 was introduced between South Parade and Radford.